Yes, Jelly Bean has been out for months, but this was not a terribly well-received phone. Usually only the top-tier devices get the best update love. 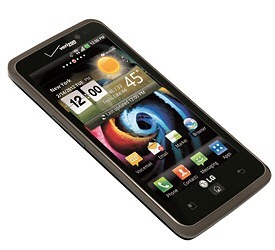 Ice Cream Sandwich is at least modern software, and it's a huge leap ahead when compared to Gingerbread – really, the old LG UI was incredibly ugly. The update should hit devices in the coming week or so. Check the Verizon update docs for more details.